Everyday people come up with innovative ideas for products and services they’re sure will be impactful. But where in the market should they aim their products in order to increase their odds of success? The temptation is often to target innovations at the most attractive segments of existing markets. The Theory of Disruptive Innovation, coined by Harvard Business School Professor Clayton Christensen, lays out a different path, recommending that new growth ventures aim their products at the low end of existing markets or even better, at markets that don’t yet exist. The rationale behind this recommendation is that the competitive intensity in these market segments is low enough to provide the new growth venture with the breathing room it needs to move upmarket to more profitable segments over time. 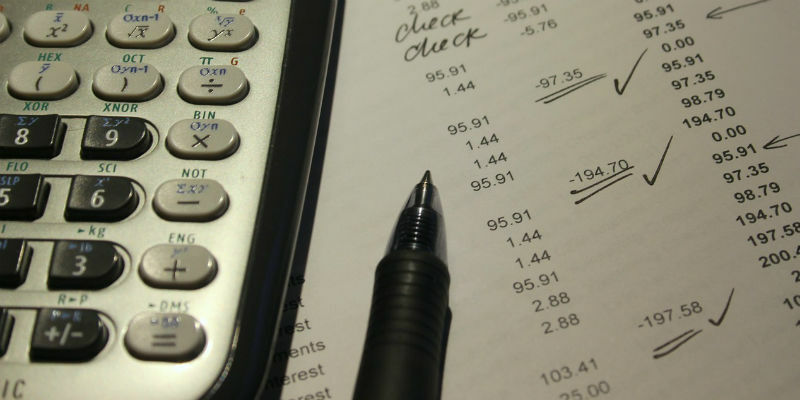 Further, disruptive entrants have the added benefit of an easier path to financial sustainability due to business models that can be profitable even where profits have traditionally been low. In spite of these benefits, many companies elect the alternative path, aiming their new growth ventures at the high end of the market where incumbent competitors are motivated to stamp out new entrants. This temptation often occurs when a startup invents a “better mousetrap” and believes that its superior product will allow it to peel customers away from incumbents. Competing in this fashion is what we refer to as sustaining competition. While both strategies have their advantages, Professor Christensen’s study of the disk drive industry showed that new ventures that embraced a disruptive strategy were six times more likely to succeed—37% of disruptors succeeded compared to just 6% of all growth efforts. This is one of the powerful insights from the Theory of Disruptive Innovation: in a world where companies are desperate for growth, disruption offers a path that dramatically increases the probability of finding that growth and doing so profitably. That’s not to say that it is impossible to crack into a market by aiming straight for entrenched incumbents. There are companies that have pushed into existing markets through sustaining competition. But as we will see, the key ingredients behind these efforts are often an enormous amount of capital and the willingness to bleed red ink for many years. Let’s examine two such examples: Microsoft Xbox and Tesla. Microsoft’s Xbox gaming console launched in late 2001 into a sustaining competition with Sony’s Playstation, the dominant incumbent at the time. The ensuing years showcased just what sustaining competition looks like. Breaking into the hyper-competitive game console market required large investments in the form of price discounting, developer incentives, and next generation consoles. Xbox eventually succeeded in becoming a strong #2 competitor in the console market, particularly with the well-reviewed and commercially-successful Xbox 360. But achieving this success took a tremendous financial toll. We estimate that Xbox may have required Microsoft to absorb up to $8 billion* in red ink until it achieved consistent profitability in 2008. And that doesn’t account for the money Microsoft had to invest in the years leading up to 2001 in preparation for the launch. So you want to start a car company? For decades, business professors have taught their students why no one has started a new car company in recent history. The answer has typically been that it would cost billions of dollars just to enter the market only to be greeted by intense competition from deep-pocketed incumbents. Why would anyone shell out so much money to take on such a long-shot challenge? Undaunted by this analysis, CEO Elon Musk and Tesla set out to do just that. In 2008 Tesla launched its Roadster sports car and in 2012, Tesla launched its Model S electric vehicle into sustaining competition with luxury vehicles like BMW and Mercedes-Benz. Elon Musk sought to dazzle the market at the high end, building brand equity and customer loyalty, and then use the profits from those high-end models to move downmarket. However, while Tesla has certainly dazzled the world with amazing vehicles, it has not consistently generated excess profits that could be invested in newer models. In fact, in all the years of financials that Tesla has reported publicly, it has burned a cumulative $11.7 billion of cash. So to fund its growth efforts, Tesla has had to rely on regular trips to the capital markets for equity and debt financing. 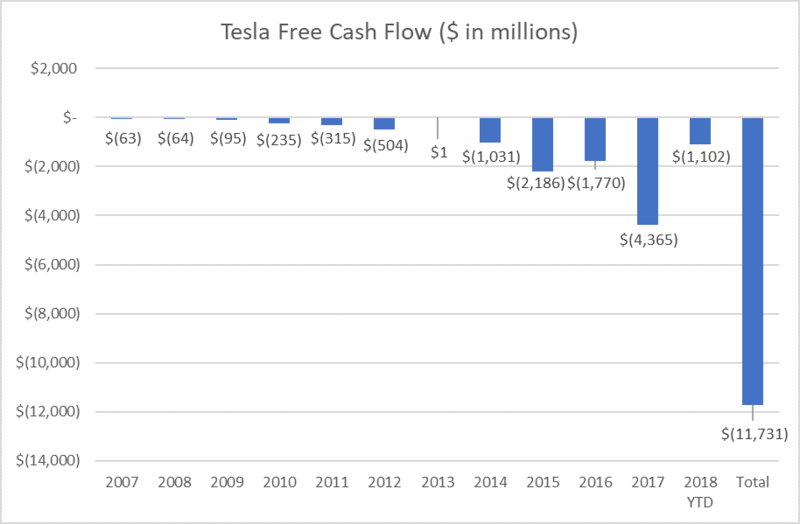 With the launch of the Model 3 in 2017 and the ramp of its production in 2018, Tesla was able to generate ~$800 million of positive free cash flow in its most recent quarter. However, Elon Musk recently warned that the “road ahead is very difficult” for Tesla, noting that its vehicles are still priced out of range of most consumers and that competition from established incumbents increases the difficulty of Tesla’s path forward. We will be fascinated to watch how this market plays out as companies like Mercedes-Benz and Audi launch their high-end electric vehicles and the sustaining competition heats up further. Microsoft Xbox and Tesla show that it is possible for a company to barrel its way into a market by competing head-on with incumbents. But for those without seemingly limitless funds, a disruptive strategy is a far easier and smarter way to enter new markets because winning a sustaining battle often entails an enormous financial cost that most new ventures cannot support. *Source: Microsoft SEC filings. 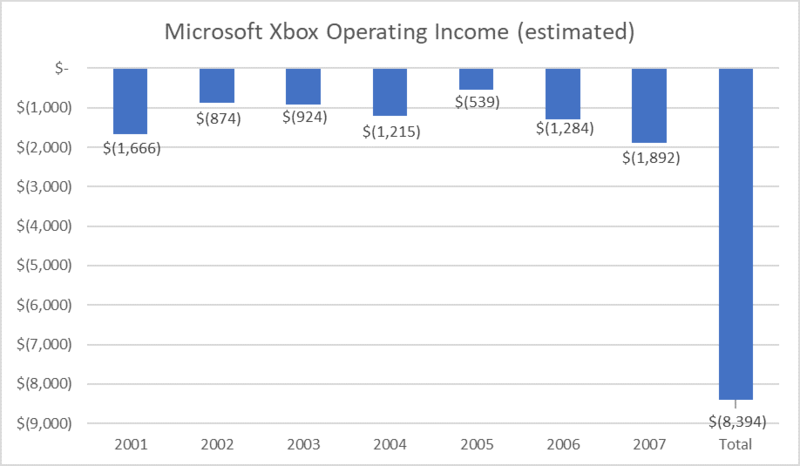 $8 billion estimate is the sum of segment level operating income for the following segments in each year as Microsoft reclassified Xbox financials: 2001 – Consumer Software, Services, and Devices, 2002-2004 – Home and Entertainment, 2005-2007 – Entertainment and Devices. This analysis assumes that Xbox was the dominant contributor to each of these segments, but there were certainly other products and services contained in these financials. Rich is the director of the Visiting Fellows program at the Clayton Christensen Institute. 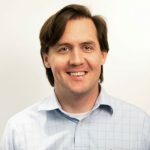 His current research focuses on emerging trends in mobility and on how organizations can implement disruptive strategies.